Contact us for professional commercial painting services. The appearance of your business speaks volumes to prospective clients/customers. Peeling or faded paint on the exterior, dingy interior walls, rusting metal doors or railings—it all leaves a bad first impression. If any of this makes you wince, chances are your business is due for a repaint. 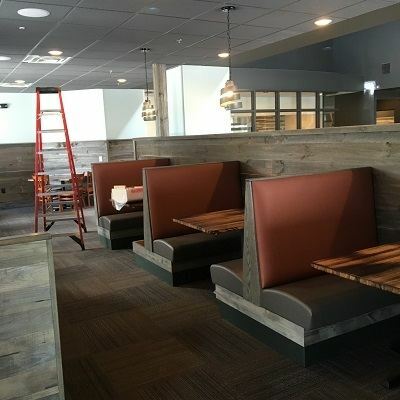 Lackluster interior and exterior finishes also take their toll on employee morale. Updating your professional environment is a cost-effective way to improve how everyone visiting or working in your building feels about your business. K2 Painting crews have extensive experience with all types of commercial buildings, including industrial buildings, historic buildings, restaurants, retail stores, fire stations, banks, gas stations and many more. Check out photos of our work or contact us for a quote today! From floors to ceilings our painters leave commercial interiors spotless. K2 Painting contractors prioritize safety, scheduling and cleanliness when working on commercial interiors. You can count on our professional painting crew to arrive promptly and work efficiently to minimize any disruption to your business. What sets K2 Painting apart from other Milwaukee area painters is our attention to detail, from floor to ceiling. No drips, no runs, no uneven lines where walls meet ceilings. We use quality paints for long-lasting protection of your property, both inside and out. And because we know how paint odors can affect people working in an office, we minimize the impact by using low VOC products and working around your business’s schedule. We work safely and efficiently to renew and refresh building exteriors and structures. K2 Painting has the experience and equipment to take on a wide range of painting, cleaning and protective jobs for the outside of your commercial building. Our professional painting contractors conduct proper surface preparation before applying the exact right coating, paint or finish to exteriors and structures. Our painters are equipped to paint the exterior of a wide range of commercial and industrial buildings including manufacturing plants, offices, shopping malls, hotels, garages, distribution centers and much more. When you choose K2 Painting you can rely on clear communication, direct owner involvement and an absolute commitment to completing the job to the highest standard, backed by our 5-year satisfaction guarantee. K2 Painting is committed to exceeding your expectations whether we’re giving your family business a fresh coat of paint, providing a new coating system for structural steel at a manufacturing plant, or painting your home. Every job is guaranteed for five years. For the first two years we’ll gladly fix any issues you bring to our attention, even if the problem stems from underlying material and has nothing to do with our workmanship.For years 3-5 we will address any aspect of our painting work if you’re not completely satisfied. K2 Painting uses only quality painting and finishing products in order to meet the standards of our five-year warranty. We’ll select the appropriate coatings to protect and beautify your building inside and out. Whether you need an anti-rust coating on a metal roof or structure, a concrete finish for your factory floor or a durable elastomeric paint for a brick building, K2 Painting has the experience to choose the materials best for the job. K2 Painting employees are full-time professional painters committed to quality work carried out with exacting attention to detail. Our painting company is the perfect size for commercial painting work: big enough to get the job done, and small enough so every job has a high level of owner involvement. 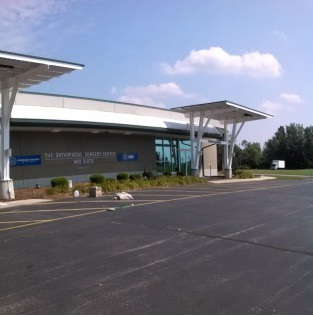 We’re proud to offer valuable commercial painting services to other Wisconsin businesses. Just call or contact us online and we’ll be happy to put you in touch with a reference or schedule a visit to your location to provide you with a written estimate. 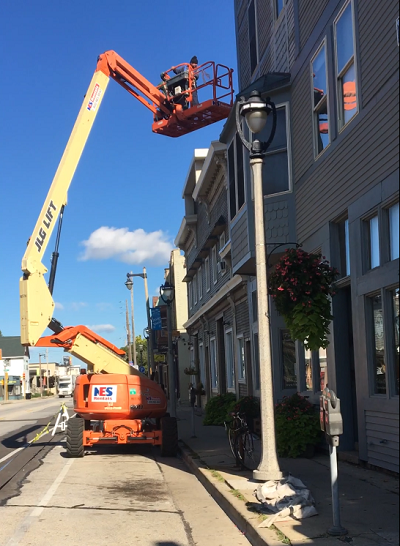 From our Brown Deer location, K2 Painting serves businesses and industry in many Southeast Wisconsin locations including including: downtown Milwaukee, Oak Creek, Franklin, Wauwatosa, West Allis, Delafield, Pewaukee, Brookfield, Waukesha and the surrounding cities. Not sure if you’re in our service area? Contact us anyway! We’re willing to drive a little farther for the right jobs. Get a FREE commercial painting estimate from K2 Painting online or call 262-242-0449.